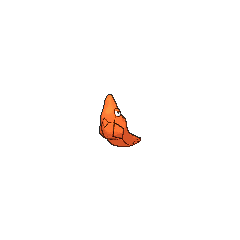 Metapod in game: 1,334 Who? Important notice! 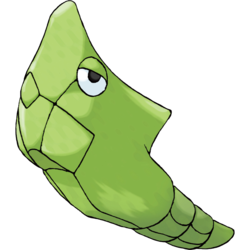 Pokemon Metapod is a fictional character of humans. 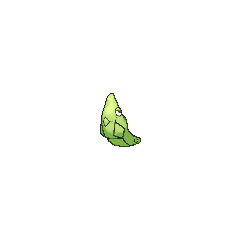 Metapod (Japanese: ????? Trancell) is a Bug-type Pokémon. 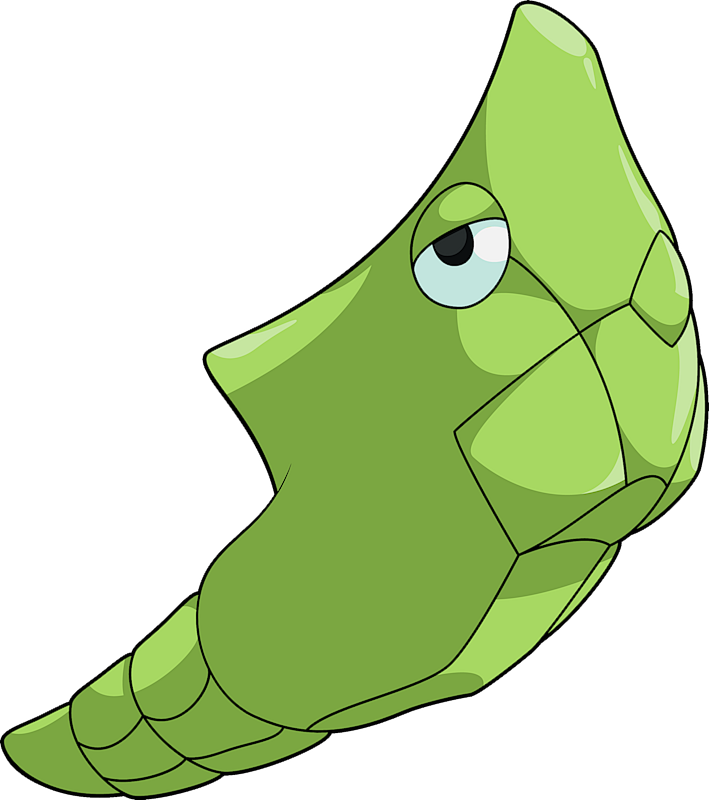 Metapod resembles a green chrysalis. Its body is crescent-shaped with several segments making up the lower point. The front of its shell resembles a face with heavy-lidded eyes and a sharply pointed nose. The back of its shell consists of several geometrically shaped portions and projections. Its soft body is protected by a hard outer shell while it undergoes metamorphosis. While this shell is said to be as hard as steel, a sudden, powerful impact could cause its tender body to pop out, leaving it completely exposed. Metapod generally remains motionless, preparing its soft innards for evolution inside its hard shell. 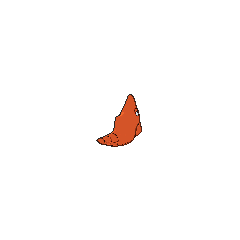 If an enemy discovers Metapod, it is unable to do anything other than harden its outer shell. Metapod lives in forests. 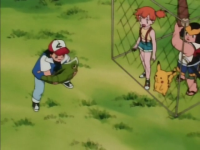 Ash had a Metapod that he caught as a Caterpie and evolved in Ash Catches a Pokémon. It eventually evolved into Butterfree in Challenge of the Samurai. Samurai, in Challenge of the Samurai, battled Ash's Metapod with his own Metapod, but because both Metapod only knew Harden, the battle went on for hours until a swarm of Beedrill forced the battle to end. In Gettin' The Bugs Out, Bugsy used a Metapod against Ash for the Gym Battle. 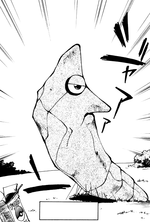 Unlike most Metapod, this one was actually able to fight back by using Tackle. Multiple other Metapod were also seen in the Azalea Gym in the same episode. In Caterpie's Big Dilemma, Xander's Caterpie became giant-sized after eating some enhanced Rare Candies. Xander's Caterpie knocked down part of a radio tower in order to make a place for it to evolve into Metapod. It later evolved again to become a Butterfree. Multiple Metapod appeared in Butterfree and Me!, including one that Ash worked with to help it eventually evolve into Butterfree. Multiple Metapod also appeared in Celebi: Voice of the Forest. A Metapod had a small cameo in Tracey Gets Bugged as one of the Bug Pokémon on Murcott Island. A Metapod appeared in Illusion Confusion! as an illusion created by Haunter and Gengar. A Metapod was used by one of the students of the Pokémon Trainer's School in Gonna Rule The School!. 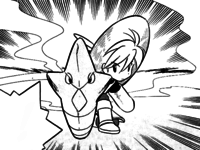 A Metapod appeared in SM003, as a silhouette. A Metapod appeared in SM008. Metapod's first appearance is a cameo in Bulbasaur, Come Home! as one of the Pokémon that gets out of his Poké ball in Professor Oak's Laboratory. Yellow's Caterpie, which was called "Kitty", briefly evolved into Metapod before evolving again into Butterfree during Yellow's showdown with Lance. Magical Pokémon Journey PPP02 ?Metapod (Cocoon Pokémon)? Metapod is unable to move on its own. Its only attack method is "harden." Ume Aoki, a Japanese cartoonist famous for her work on the manga Hidamari Sketch, utilizes a likeness of herself cosplaying as a Metapod to represent herself in her works. Trancell appears to be a combination of transform and cell or shell. Japanese ????? Trancell From ???? toransu and ?? seru. Also likely a pun on ????? randoseru. Cantonese Chinese ??? Titgaapchùhng "Armored bug"; ?? means "beetle"
Mandarin Chinese ??? / ??? Tiejiáyong "Armored chrysalis"